"Yum, yum! Sometimes I add some finely chopped semi-sweet chocolate. These are perfect for baby showers or wedding showers. A plastic sandwich bag can be used instead of a pastry bag by filling with the cream cheese mix and making a tiny cut in the corner." Cut the tops off of the strawberries and stand upright on the cut side. Make a cut 3/4 of the way down from the tip of the strawberry towards the bottom. Beat together the cream cheese, sugar, and liqueur until smooth in a mixer or a food processor. Place into a piping bag with a star tip. Pipe into each strawberry and arrange on a serving platter. 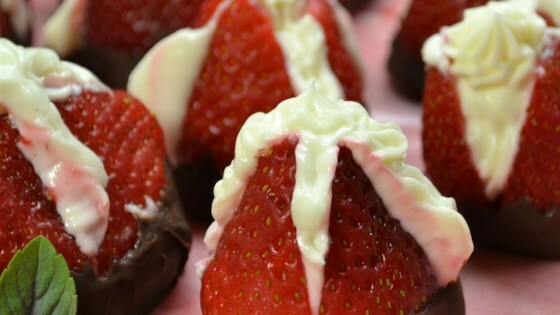 Fresh strawberries are stuffed with sweetened cream cheese.